The Obama Administration has revoked the permit for one of the largest mountaintop removal mining projects in the United States, in West Virginia. Said permit was issued during the fossil fuel fueled Bush Administration, after a long court battle. Mountaintop removal mining involves blasting the tops off mountains to get to the coal. Very destructive, as you can see from the image below. After almost forty years since the Clean Water Act was passed into law, the Environmental Protection Agency (EPA) has never retroactively vetoed a mining permit. This is a first. 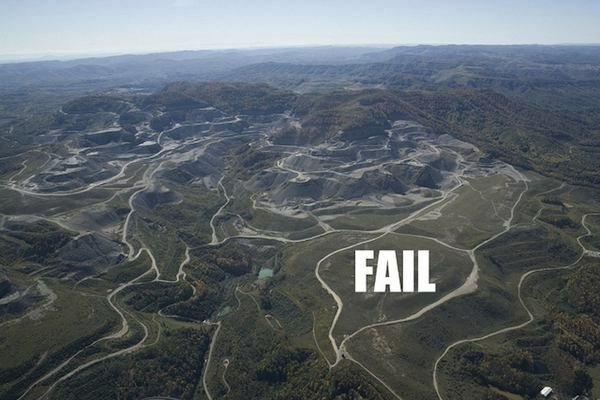 The EPA has retracted the permit for Arch Coal’s 2,300 acre mine planned for Logan County, West Virginia. This should serve to halt most mining activity. The EPA sighted more than 50,000 public comments and held a major public hearing in West Virginia. The EPA said it revoked the permit because it found that new scientific research on mountaintop removal mining indicated that potential harm to streams and watershed areas surrounding the project could be significant. No kidding. The decision is a huge win for those who would like to experience a cleaner and more environmentally sustainable world. I’m sure head NASA climate scientist James Hansen will be celebrating the win. In a show of solidarity with activists, Hansen was arrested protesting mountaintop removal coal mining in West Virgina. Unsurprisingly, the decision to revoke the permit has been attacked by West Virginia leaders and the mining lobby. This decision by the EPA also comes as Republicans in the House of Representatives, together with some coal state democrats, are attempting to restrict the powers of the EPA itself. You can bet this long-running fight is not going to end here. Next post: Bike Commuting: More People Are Biking To Work. Are You?